Corry, PA, May 29, 2018 – Viking Plastics, a leading injection molding and value-added assembly service provider and a Tier 1 supplier to General Motors, announced it has received the 2017 General Motors Supplier Quality Excellence Award for achieving the highest levels of performance in quality excellence. This is the fourth consecutive award earned by Viking Plastics. Every day, all of Viking Plastics’ 150+ employees are encouraged to take initiative to improve processes by eliminating waste and optimizing workflows, which enables Viking Plastics to deliver the high-quality products customers like General Motors demand. For more information on these initiatives, visit vikingplastics.com and view “Our Lean Journey”. 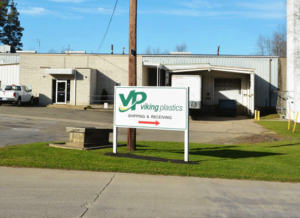 Founded in 1972, Viking Plastics is a privately held, injection molding and value-added assembly service provider, delivering innovative products including sealing solutions, custom injection molding, assembly, and post-molding secondary services. Viking Plastics’ multiple plants house more than 60 global molding machines, with capabilities spanning the range from 50- to 720-ton injection molding, as well as capabilities including 2 shot, insert molding, and automated assembly cells. Viking Plastics is ISO/TS 16949:2009, ISO 14001:2015 and ISO 9001:2015 certified.